Extracting honey at the wrong time (Part 1). Some unsubstantiated thoughts on propolis. Just a bit more than a year ago (March, 2016), my 91-year old Mom was diagnosed with a terminal medical condition. Though very difficult to endure, this news was simply one of life’s rites of passage for my family and me. There was, as is, no way to avoid it. My two brothers and I did our best to support Mom and help her through this stage of her life. She lived about 800 miles from me. My wife and my family made many trips to southern Alabama to visit, to offer support, and to plan for the inevitable. We phoned nearly every night. Mom’s ordeal ended in mid-October, 2016. My bees have always been the center of my professional life, but for about nine months, I had to let them make their own way. I am not apologetic to you or my bees. My priorities and energy had to be elsewhere. Now that gloomy but loving period has passed. I am left with a peculiar situation in my beeyard. I have full deeps of honey from last year – both Spring and Fall honey. My colonies were rarely fully inspected. If any of you truly believe that “bee space” is the end-all solution to removable frames, try this. Do not open your powerful colonies for about a year. Then open them. You will find that propolis-bonding combined with propolis-reinforced beeswax will make a traditional hive tool a laughable device. Could it be worse? Sure! I only use deeps1. My bees were busy while I was distracted. They filled deeps with honey. Presently, I have about ten 90-pound boxes that are block solid. I had to get them off of hives that were five deeps high, and there are still yet a few more in the apiary. 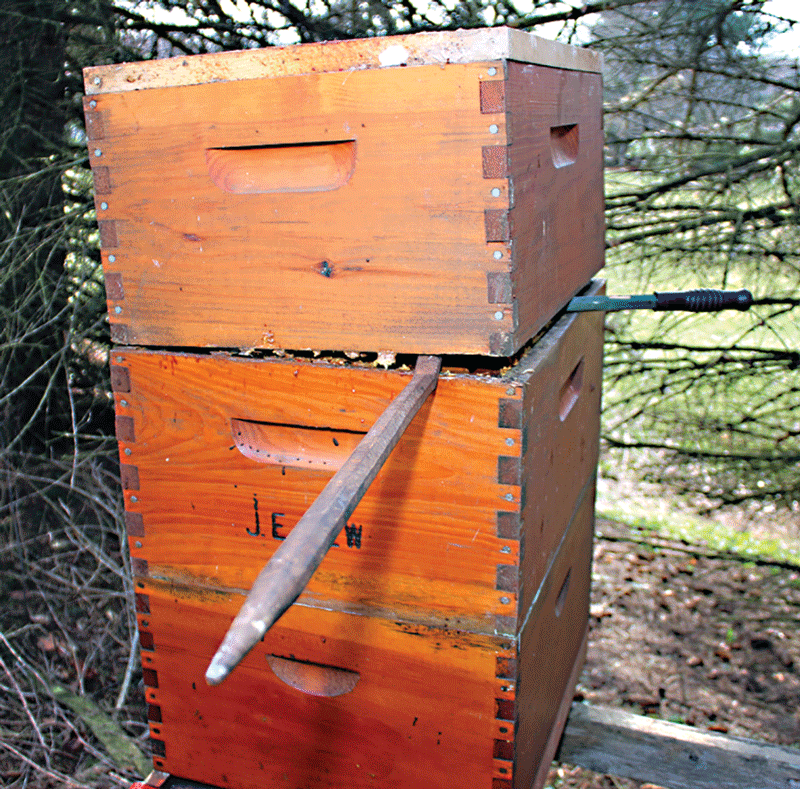 Heavy pry bars being used to break stuck hive bodies. The back pry bar is holding the weight so I can lever from the front. 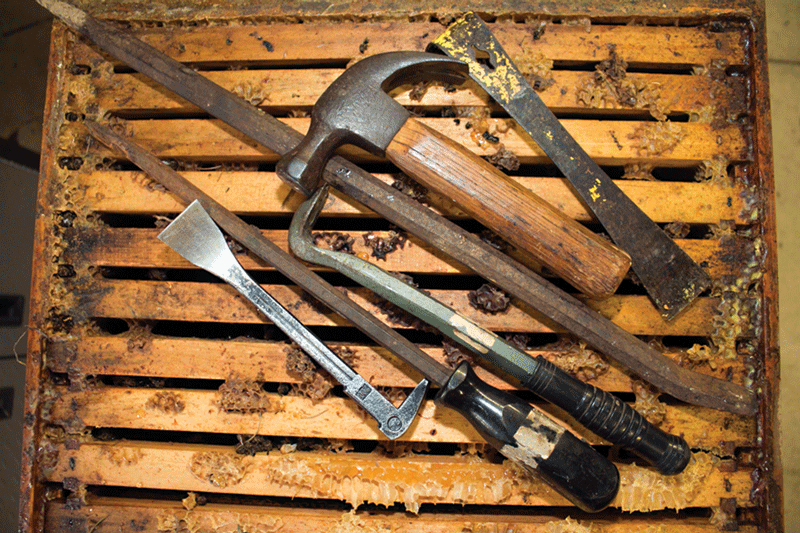 For hives that have not been opened in many months, a standard hive tool was just not enough. It flexed to the point of either bending or breaking. I needed much heavier firepower. Many years ago, I used an aggressive procedure for opening a soundly glued hive that I had seen being employed by Australian beekeepers. When I later used the procedure in Ohio, the hives were near the ground – only about 8” above ground level. The procedure was to tip the colony backward and as gently as possible let it drop to the ground – laying on its back. 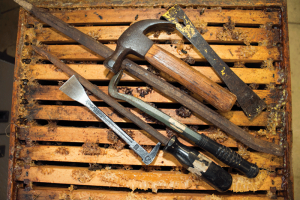 I would then use a hammer to drive a common hive tool into the glued joints – banging and driving – until I could begin to break the beehive apart. The bees were well aware that all of this was ongoing. Being fully suited with smoker blasting was a good idea. It is not so much the propolis that holds the hive together as it is the bridge combs (ladder combs) that firmly glue all together. 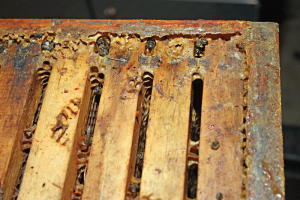 When the equipment breaks apart, drone brood and leaking honey are everywhere. Of course the frames were cemented in place. After breaking a hive box from the main colony and while the box was sitting on one end, I would strike the bottom bars on each end until – finally – I was able to separate a frame or two. I carried a short-handled hammer just for that purpose. It was a scene. I have no photos. My arsenal of heavy duty hive tools. The regular tool is of little use. I increasingly became a proponent of raising my hives higher from the ground. They are all now 18-24” high on various types of hive stands. 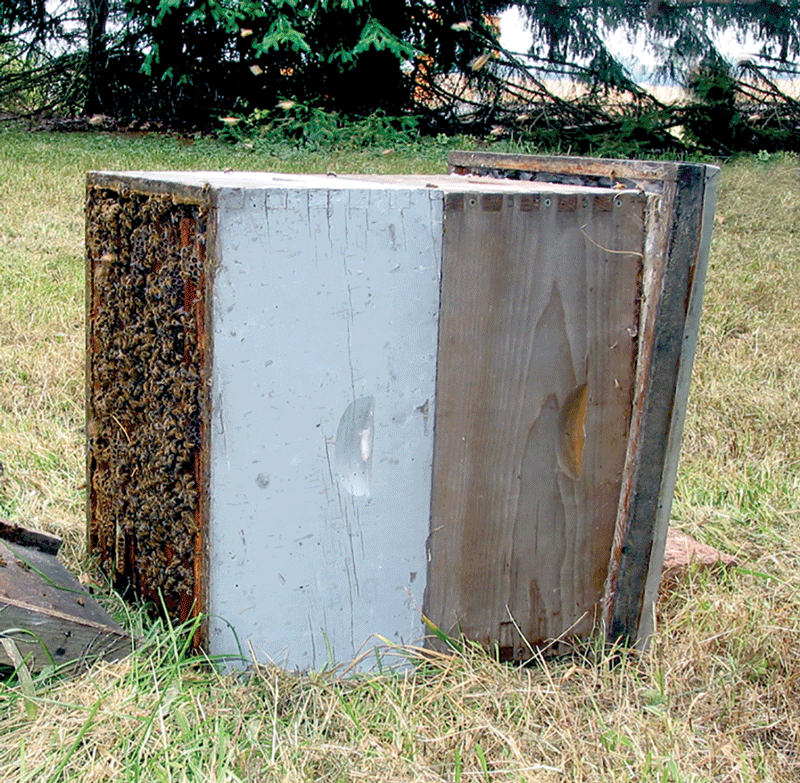 Simply pushing the hive backward and letting it fall to the ground would be catastrophic. I had to break the solidly stuck boxes apart while they were on the hive stand. I did this process late this past Winter, but on a day the bees could fly. I knew the disturbance would be great. I wanted the exiting defensive bees to be able to return the hive. The small bluish pry bar on the bottom left, with the upturned blade was critical to my procedure. It opened the first small crack that I could then use to get the larger pry bars into hive. I found that I had to pry from the tops of two or three frames. If I put leverage force on the 3/8” edge on the top end of hive body, the weight and pressure would frequently crush or dent that narrow edge. In the photo, the heavier pry bar was in use after the initial break was over. 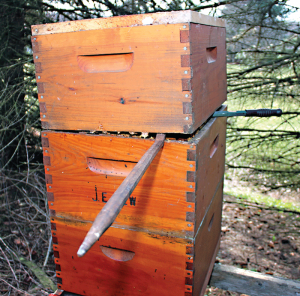 Once the boxes had been separated, the heavy bars could be used anywhere on the hive box edges. Soundly propolis/wax glued top bars. I have written about these heavy deep supers and their use by beekeepers with limited strength (or waning strength). Increasingly, that description seems to be mine. Several years ago, I had my shoulder screwed back together. It works well now, but I do not want to return to those physical therapy days. A common response would be to “take the frames out one at a time,” I ask you, the reader, to please review the part above where I mentioned that my hives had not been opened in months. Even if I could manage to remove the first frame, followed by the remaining nine frames, and finally get them all back in the box, too much time would be required for keeping the hive open. In some instances, the top bar would have pulled off before the frame would pull free. 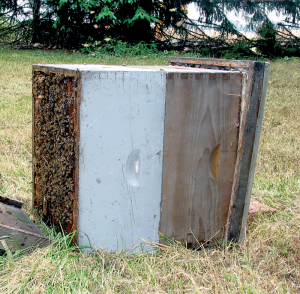 Unworked hives for this long, become a beehive battle fortress. This characteristic would have survival value in both wild colonies and managed colonies. If only a frame or two were soundly stuck, my short hammer could be used to drive out one of the easier frames from the bottom allowing the stuck frames to be more readily moved. However, as stuck as these frames were, using a hammer would have destroyed the bottom bar ends. I brought my work stand as near as possible. I made certain that the box to be removed was thoroughly freed, and with a heave-ho, I moved the deep to the work stand. Then I took a break. Only nine more to go. My small 48-year old International Cub Cadet 104 does a decent job int he tight spaces of the beeyard. (All four tires original – 10hp.) Ironically, one of the tires on the trailer is an Atlas tire that is about 50 years old, too. It has been in the weather all those years. I just replaced tires on my road trailer that dry rotted in hardly 10 years. It’s clear; many things are just not made the way they once were. After I got the heavy box to my work stand, I backed my old garden tractor with a small, narrow trailer near the scene and moved the deeps from the work stand to the trailer. All went pretty well. The weather was cool enough that there were not many bees in the deeps that I removed. I took another break. Ultimately, I have a two-part (probably harebrained) plan. At this point the first load of honey deeps are now in my shop. That is the beginning of my first plan. I used my heat gun to soften the propolis and wax enough for me to experiment with removing the stuck frames. That seems to work very well. Before extracting, I will need to take out the frames and scrape all sides to remove wax and propolis. I have the temperature set to 70°F in the shop, but that will not be warm enough to make the cold, low moisture honey freely flow while extracting. At this point, part of my plan is untested. I will let you know next month. 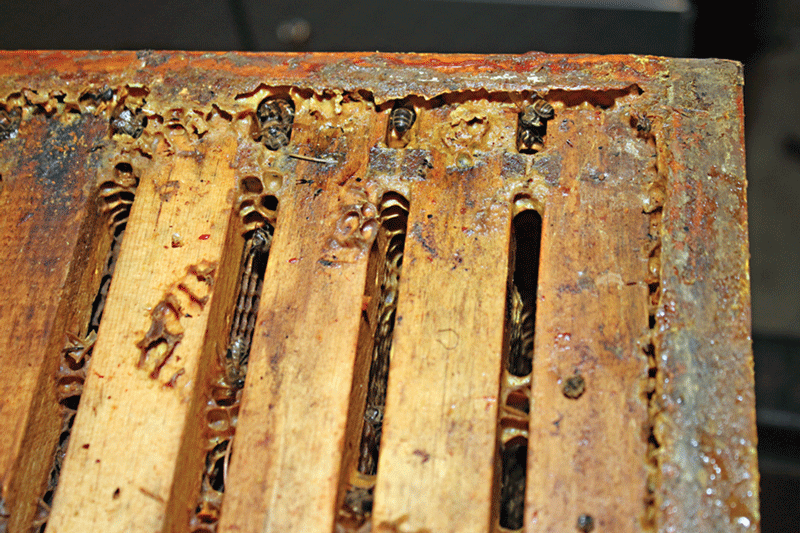 My second plan concerns extracting the honey from these thick-honeyed frames. I will need these boxes in a few weeks for the 2017 nectar flow (I hope). I have an idea how I will apply extra heat to get the frames warmed and scraped. I will also be warming my small extractor. Thus far, I have had fairly good luck. Many of the deeps are off, and I have not hurt myself. Now comes stuck frame removal, scraping, and extracting. I will stop at this point and finish next month. Big late season snow is predicted for tonight. I duly hope that the weather will be much more Spring like for the extracting experience. Wads of propolis atop a small cake of rendered wax. Propolis needs and water needs within the colony are two colony topics that I require more tutelage to understand. While I have written many pieces about water foragers and their suicidal collecting trips, I have only given passing note to propolis. I have said on oh-so-many occasions that one or two year-old frames in a new, small colony are glorious to work. They come out so easily. Apparently, the bees know this, too, or they have other reasons for gluing frames in place. If given abundant time, bees will profoundly apply propolis on everything – especially frames. It seems to me to be an on-going job. It seems never to be finished. Every Spring, more gums and resins come into the hive. Why do you think that would be? Are the bees continually bringing in gums and resins for propolis production to stabilize and coat the colony’s internal cavity? Are they bringing in the building materials for propolis because the plasticity or its healthy qualities need refurbishing? In other words, does propolis have a specific lifespan? Do different cavities in different areas present different propolis needs? A hundred times, years ago, I heard it said so I, too, have said that bees preferred wooden hives and frames over plastic hives and frames. “It’s more natural.” If either wood or plastic feels or does not feel natural, why are both these surfaces targets for propolis applications – especially wood. 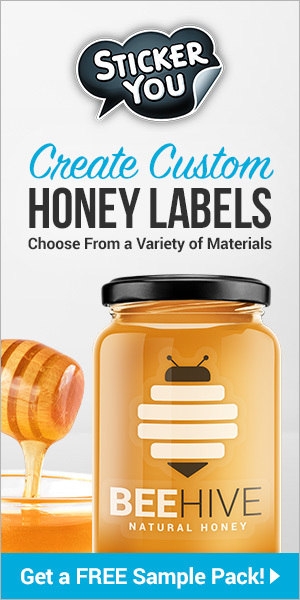 Given enough time, bees will coat the entire hive surface with a thin layer of this product. As is everything else in the bee world, this task is seemingly a lot of work. It is also seasonal work. In my area, Spring seems to be the best time for propolis production. Summer sources provide only a small bit of production while fall offers a little bump of propolis production activity. For whatever reason, the colony that is doing all of this propolis collection will die. Starvation, predation, mites, pesticides, and queen loss – the list is long. Colonies die. Could it be propolis as much as wax combs that scout bees find appealing when they find a cavity that has been vacated by a previous colony. When bait hives are put out, should we slather the inside surfaces with propolis as well as installing a few old combs. Would this make them more attractive? Possibly, the old combs have enough propolis already to allure the bees. 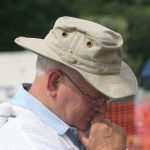 I have been conducting a multi-week program on basic beekeeping. I covered all the common topics for these new and newish bee people. In any such training program, two major events are missing – the exhilarating feel of a sting and the smells of the colony and the apiary. Propolis does not stand alone, but I suspect that the odors that propolis produce are one of the primary ingredients that give beekeeping its characteristic odor. What a major stimulus all bee audiences miss by not being able to “smell” the topic being presented. How cool it would be to be discussing apple pollination as the odor of millions of apple blossoms drifted across the room. 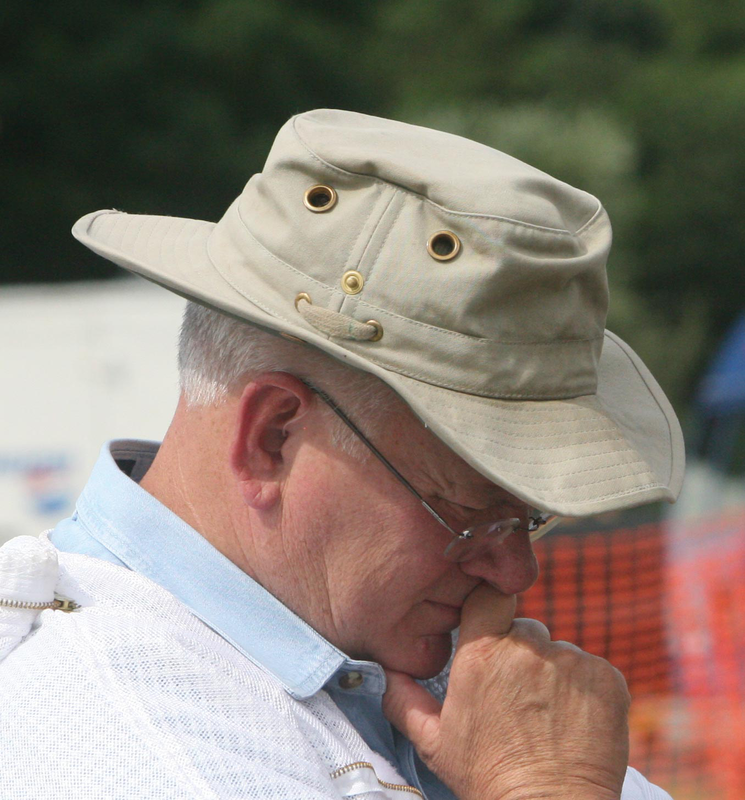 And that characteristic bee/beekeeper/beehive/storage building smell – it has become an odor of my professional life. The primary colony/apiary odors are: new pine wood, wax, smoke, and propolis and sometimes warm honey. 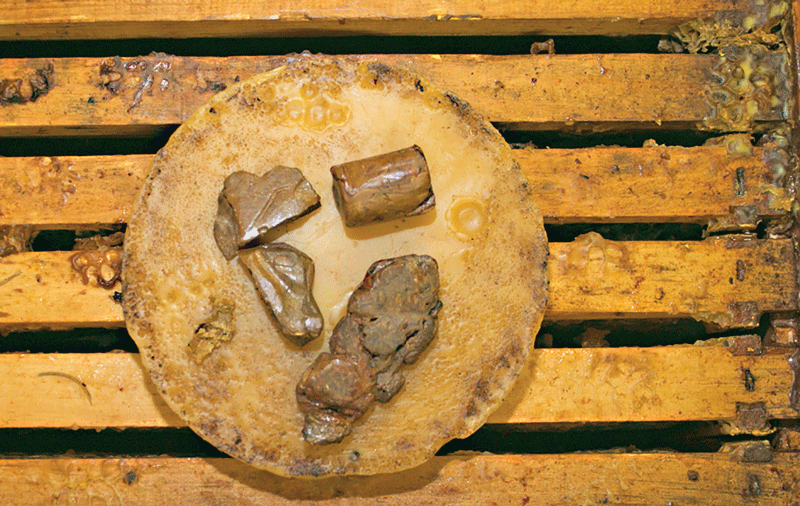 Propolis may contribute more than we realize. Do bees use that odor in some way – or are other animals/insects aware of this odor? Certainly, I do not know. I posit that propolis does not get enough respect. Nearly every year, I bang and bam on a hive that is profoundly stuck together. It’s hard work and at the time, I don’t especially care that propolis is generally unloved. Beeswax alone cannot hold a hive together so tightly. In our pillaging of the bee world as we strive to get more honey and understand more about pollination, we figuratively trample propolis. The bees certainly want the product. They will even recycle the material when it is warm enough. I’ll keep pondering. If you have any thoughts, let me know. 1At this stage of my life, I never run more than 20 colonies. I have limited energy, time, space, and devotion. (I also have six grandkids.) Years ago, for simplicity, I began to only only use deeps. 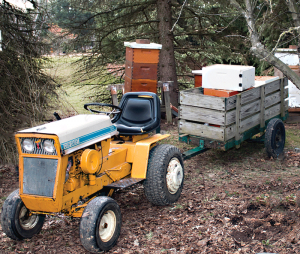 Nucs, splits, combining colonies, swarm boxes, frame replacement – all were standardized with one size of frame – deep. The big negative – my equipment, when full, is really heavy. It was not always that way. Years ago, full deeps seemed to have been lighter. Maybe honey is heavier today than it was when I was a younger man.